The Polish Commander-in-chief during the turbulent 16th to 18th centuries bore a ceremonial mace, a bejewelled, skull-cracker. He was called Hetmann, a title borrowed from the German word meaning headman. 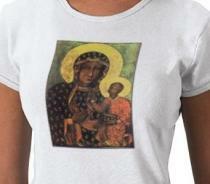 The feminine is Hetmanką, and this is the name of the Virgin as protector of Poland. Both history and geography favour the Polish national identification with Catholicism. 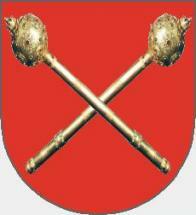 Since the split between the Roman Catholic and Eastern Orthodox Churches in the 11th century Poland has been the eastern outpost of Catholicism. The 16th century-expansion of the Ottoman Empire brought Islam to its southern border. And after the Protestant Reformation Poland found itself threatened by Hussites and Lutherans on its western and southern borders. Little wonder that this isolated Roman Catholic country sought safety from the Virgin Mary. The next century brought further proof of the Virgin's martial prowess. In 1655, so the story goes, a Swedish army attacked the mountain-top monastery in which the icon was housed, but it miraculously held out. (In actual fact, the Swedes laid siege to it to try to extort 60,000 gold talars and left when the monks, secure in their impressively fortified stronghold, refused to hand any money over. ) However, the beleaguered Polish king, gave the Virgin's military potential the benefit of the doubt, bid for her protection and proclaimed her Poland's queen. In 1717 the Pope Clement XI, in an attempt to counteract the influence of Russia (and its Orthodox Church which didn't recognise him), had his nuncio officially crown this icon “Queen of Poland”. Today Poland's national shrine to the Virgin on the mountain top at Czestochowa is one of the 10 most visited religious sites in the world with more than four million pilgrims annually. In 2007 it was announced that one of the first destinations of the new Vatican airline would be the shrine of Czestochowa. After Polish resistance ― under the banner of the Virgin ― was crushed in 1772, the country was divided up between Russia, Prussia and Austria. For over two centuries Poland disappeared from the map. With even the public use of the Polish language for the most part forbidden, only the Catholic Church still united the Polish people. It wasn't until the end of WWI that Poland once again became a nation. 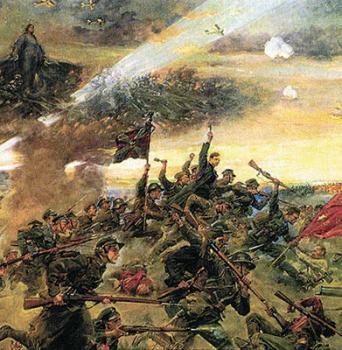 The rout of the Red Army by a popular early 20th-century painter depicts a curious cosmology. The battle rages on the ground — above that the Virgin presides over an indistinct “heavenly host” — and above them is the realm of the new reconnaisance bi-planes. However, it's now known that contributing to the unexpected victory was a feat that remained unknown until recently. Thanks to the brilliant Polish mathematician, Jan Kowalewski, who broke the Russian codes, the Poles knew all the enemy's plans, which helped them to deploy their much smaller forces to “miraculously” good effect. With the election of a Pole to the papacy in 1978 the protectress of Poland also became the personal guardian of the pope. 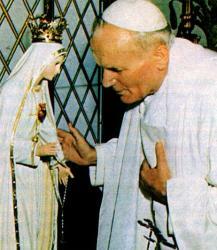 On his papal coat of arms John Paul II put the Virgin's initials in gold on a background of Marian blue. And after he survived an assassination attempt in 1981 on the anniversary of the Virgin's appearance in Fatima he was sure that she had deflected the bullet to save him. The following year the Pope gave thanks at the shrine of Fatima for his survival, and publicly consecrated the whole world to the Virgin. Like his predecessor, Pius XII, he was convinced that “the Blue Army of Fatima” was destined to overcome “the Red Army of Satan”, and he attempted to align the whole globe with the ultimate victor. See also: Brian A. Porter, "Chapter 10. Mary, Militant and Maternal", Faith and Fatherland: Catholicism, Modernity, and Poland, 2011, pp. 360-390. 6. The painting is "Cud nad Wisłą" ("Miracle on the Vistula") by Jerzy Kossak.